Someone asked me the other day how I had managed to just finish writing my 5th book in a little over 5 years. My answer was simple. The key is sleeping-in. Since we homeschool we have the luxury of doing that. Since we have made the sacrifice to educate our children at home, I am very blessed with a relaxed schedule! Over the past 5 years most of my writing has taken place from 6 a.m. to 8 a.m. I say most, not all. There are plenty of times that I write when I should be doing other things. On rare occasions entire Saturdays have been spent researching, writing, editing, re-writing, editing, and re-writing. On even rarer occasions I will write in the still of the night. But for the most part, I work in the mornings while the children are asleep. All is quiet, except for an occasional jingle on the collar of our Maltese. My mind is intensified by the aroma from the Kona coffee. Words flow. Life is good. But “sleeping-in” is not really the key. The true key to successfully accomplishing anything worthwhile is consistency. Be consistent. Keep at it. Don’t give up. Make time for writing. A little here and a little there….A few hours a day doesn’t amount to much, but a few hours a day equal 10 hours a week. And 10 hours a week add up. Some say they can only write when they are inspired. Forget that. Set time aside every day to be inspired and then write. Let me hear from all you writers out there. 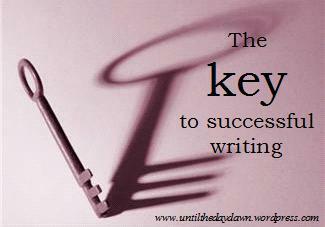 What has been “key” to your success in writing?